Create an app that connects, boosts moral and delivers a unique and gamified experience at your workplace. 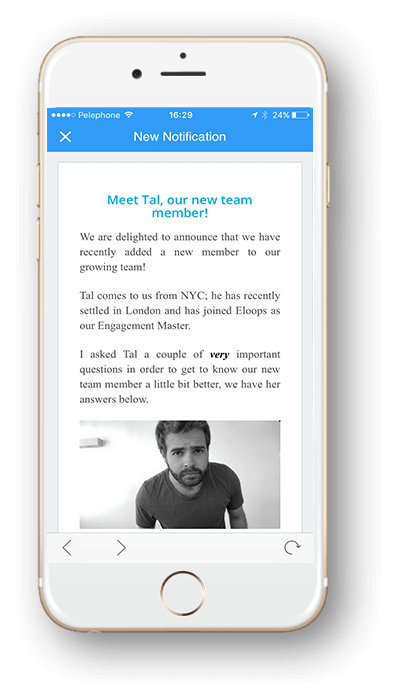 workplace experience – delivered to your employees in a branded company app. 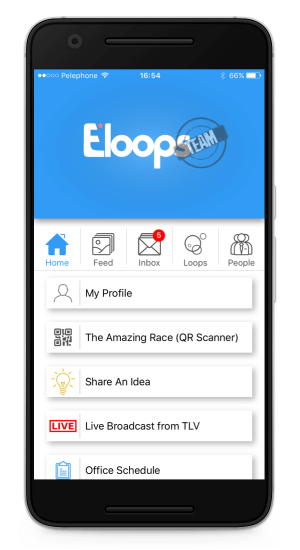 A branded company app where employees can share experiences, interact, train, play and view company-wide live feeds. It’s the place employees expect to have and want to be. Keep your employees in the loop and make sure they are always connected and aligned to the company culture and vibe. No more email clutter or hundreds messages that are not even relevant to the specific employee. Use private chats, and cross-channel communication tools to effectively reach the right employees, in the right place, at the right time with the relevant content. Create an app that delivers a personal experience that employees truly value and appreciate. Create a gamified training & learning experience from on-boarding to on-going education and skills development. Make learning fun, personal and effective while equipping your employees with all the tools and resources they need on-the-go. Create Trivias, challenges, contests and games that inspire competition – create your own or use the built-in and pre-made templates from our content marketplace. Make internal communications effective and remove borders and complications by allowing employees to search, reach and interact with each other in an easy way, directly from their mobile devices. Create connections that reach well beyond your employee app. Browse through an always updating marketplace of employee engagement content and activities. We’ve hand picked the leading providers of employee engagement activities that you can book with a click of a button. From outdoor challenges and games to virtual and online activities – connect your employees to a gamified and engaging workplace experience. 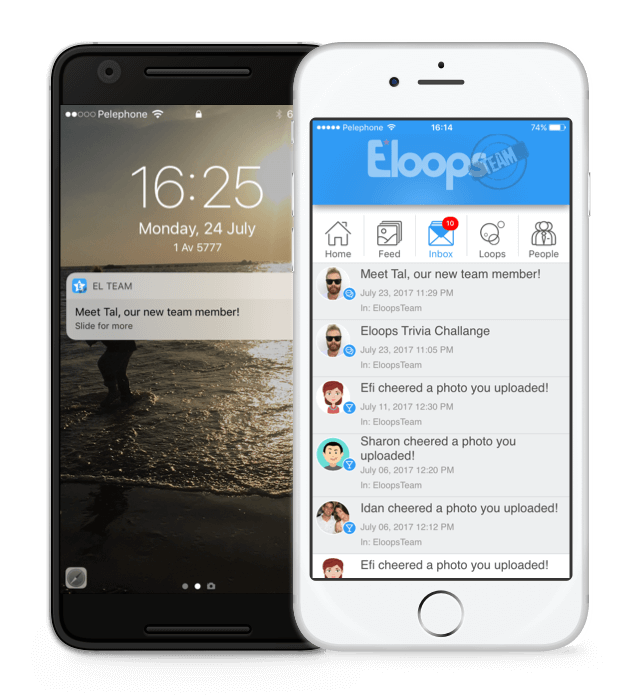 A branded employee app that reflects your branding, culture and values. 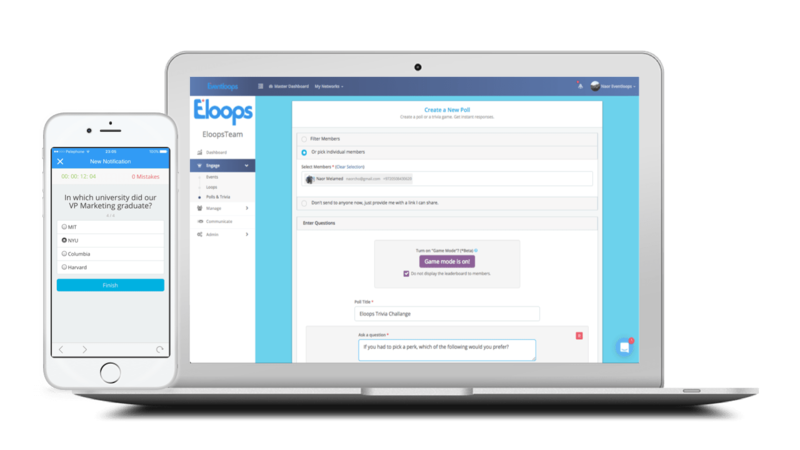 We’ve put your employees in the first place when we designed and built Eloops. We believe in creating an app that employees can be proud of for companies that appreciate and love their employees. The app theme can be update on-the-fly to reflect holidays, special events and occasions. Let’s see what you can come up with! Create a place where employees can be heard and provide important information, feedback and insights to make better decisions based on real input from your employees. Use pulse polls, surveys, quizzes, custom check-lists and forms to gather the information you need, at the time you need it from whom ever you need it. 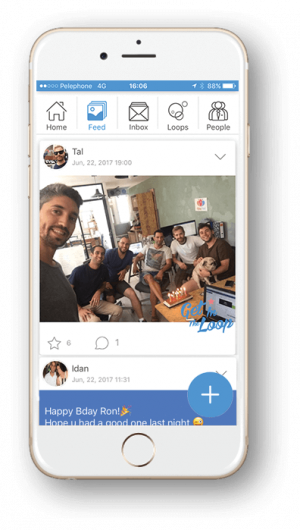 Enable employees to share moments, photos, videos and posts to private feeds and make sure all your employees are always in the loop. Allow employees to search for colleagues, view profiles, connect and reach them directly from within the app. 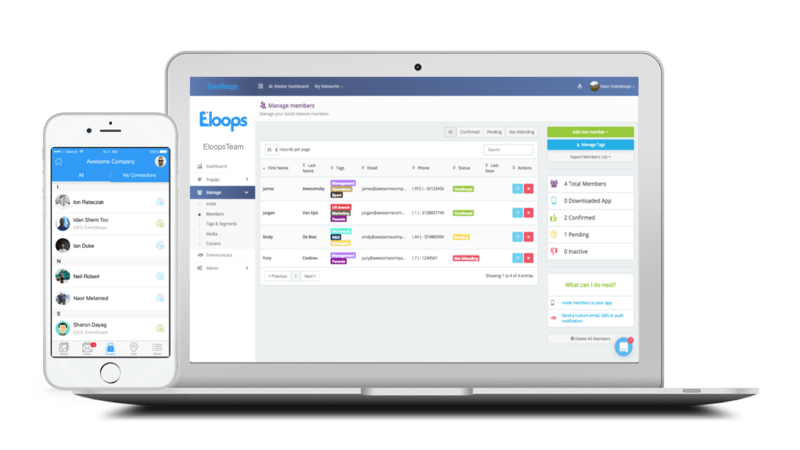 Send and schedule messages that reach the relevant employees by tags, groups and segments. Employees have a private inbox where all messages and updates can be found and managed. Employees can browse and register for company events. Every event becomes a social experience with a private loop created just for the event where all information and moments can be shared and collected. Create custom forms to collect information or checklists to make sure a task is done. Get notified when tasks are completed or when something requires your attention.